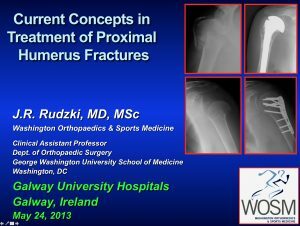 Dr. Rudzki has been actively engaged in academic research, medical education, and collaborative presentations at National and International Orthopaedic Conferences for over 20 years. 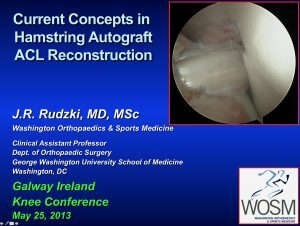 Dr. Rudzki had the privilege in residency and fellowship to train with global leaders in the fields of orthopaedic surgery and sports medicine at the world-renowned Hospital for Special Surgery in New York and the Department of Orthopaedic Surgery at the Washington University in St. Louis. These programs provided rigorous training with mentors who further inspired his love of science, research, and commitment to excellence in patient care. At the international level, Dr. Rudzki has had the pleasure of presenting from Buenos Aires, Argentina to Florence, Italy and from Galway, Ireland to Sydney, Australia. These extraordinary opportunities enable spirited and thoughtful discussion and debate in which colleagues from around the globe can learn from each other to optimize the patient care they provide at home with the best evidence-based medicine and a perspective that extends beyond regional or national trends. As a result, our team is able to partner with each patient and develop individualized, tailored treatment plans with the best medical treatments, surgical techniques, and comprehensive rehabilitation protocols to optimize results and outcomes. Selby DM, Rudzki JR, Bayever ES, Chandra RS. Vasculopathy of small muscular arteries in pediatric patients after bone marrow transplantation. Interim Meeting of Society for Pediatric Pathology September 26, 1997. Minneapolis, MN. Moss DA, Wittig JC, Bickels J, Rudzki JR, Henshaw RM, Malawer MM. Minimally invasive burr-down technique vs. en bloc resection for treatment of osteoid osteoma. 68th Annual Meeting of the American Academy of Orthopaedic Surgeons (Poster) February 28 – March 4, 2001. San Francisco, CA. Ricci WM, Rudzki JR, Borrelli J. Treatment of axially unstable proximal tibia fractures with a lateral fixed angle plate. 17th Annual Meeting of the Orthopaedic Trauma Association (Poster) October 18 – 20, 2001. San Diego, CA. Galatz LM, Brodt M, Carlisle JC, Rudzki JR, Silva MJ, Yamaguchi K. The effect of subluxation on joint contact area of the elbow. 48th Annual Meeting of the Orthopaedic Research Society (Poster) February 10 – 13, 2002. Dallas, TX. Ricci WM, Rudzki JR *, Borrelli J. Treatment of axially unstable proximal tibia fractures with a lateral fixed angle plate. 17th Annual Smith & Nephew Residents’ Conference August 9 – 10, 2002. Memphis, TN. Rinella A, Bridwell KH, Kim Y, Rudzki JR, Edwards CA, Lenke LG. Late complications of Adult Idiopathic Scoliosis primary fusions to L4 and above – Effect of age & distal fusion level. 37th Annual Meeting of the Scoliosis Research Society Sept 19 – 21, 2002. Seattle, WA. Matava MJ, Rudzki JR, Wright RW. Treatment of Anterior Cruciate Ligament Tears in the National Hockey League. A Survey of the NHL Team Physicians’ Society. Annual Meeting of the NHL Team Physicians Society February 1-2, 2003. Ft. Lauderdale, FL. Rudzki JR *, Goldfarb CA, Hughes M, Ricci WM, Borrelli J. Long-term functional results of distal radius fractures in young adults. 20th Annual Meeting of the Orthopaedic Trauma Association – Highlight Paper Award October 8-10, 2004. Ft Lauderdale, FL. Goldfarb CA, Rudzki JR *, Hughes M, Ricci WM, Borrelli J. Long-term functional results of distal radius fractures in young adults. 72nd Annual Meeting of the American Academy of Orthopaedic Surgeons February 23-27, 2005. Washington, DC. Rudzki JR *, Galatz LM, Silva MJ, Brodt M, Silva MJ, Yamaguchi K. The effect of subluxation on joint contact area of the elbow. 23rd Annual Meeting of the Mid-America Orthopaedic Association April 20 – 24, 2005. Amelia Island, FL. Rudzki JR *, Nunley RM, Dobbs MB. The Ponseti method for treatment of clubfoot associated with myelodysplasia. 23rd Annual Meeting of the Mid-America Orthopaedic Association April 20 – 24, 2005. Amelia Island, FL. Goldfarb CA, Rudzki JR, Hughes M, Ricci WM, Borrelli J. Long-term functional results of distal radius fractures in young adults. Annual Meeting of the American Society for Surgery of the Hand September 22-24, 2005. San Antonio, TX. Rudzki JR *, Kadrmas WR, Lyman S, Adler RS, Pearle AD, Verma N, Fealy S. Contrast-enhanced ultrasound of the vascularity of the rotator cuff. West Point Day – Northeast Sports Medicine Fellows Conference. May 12, 2006. West Point, NY. 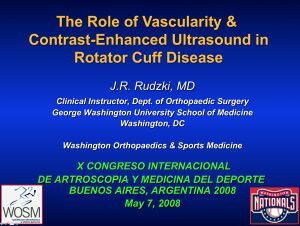 Rudzki JR *, Kadrmas WR, Lyman S, Adler RS, Pearle AD, Verma N, Fealy S. Contrast-enhanced ultrasound of the vascularity of the rotator cuff. 74th Annual Meeting of the American Academy of Orthopaedic Surgeons February, 14 – 18 2007. San Diego, CA. Heyworth B, Rudzki JR, Kelly BT. Revision Hip Arthroscopy. 74th Annual Meeting of the American Academy of Orthopaedic Surgeons (Poster) February, 14 – 18 2007. San Diego, CA. Rudzki JR *, Kadrmas WR, Lyman S, Adler RS, Pearle AD, Verma N, Fealy S. Contrast-enhanced ultrasound of the vascularity of the rotator cuff. Specialty Day – American Shoulder & Elbow Surgeons February, 17 2007. San Diego, CA. Nominated for Charles S. Neer Award. Gulotta LV, Rudzki JR, Kovacevic D, Warren RF, Chen CT, Williams RJ. The role of apoptosis in a rabbit model of osteochondral autograft transplantation. Eastern Orthopaedic Association. OREF NYC Resident Research Symposium, Columbia University, NY, NY. May 25, 2007. First-place podium presentation. Gulotta LV, Rudzki JR, Kovacevic D, Warren RF, Chen CT, Williams RJ. The role of apoptosis in a rabbit model of osteochondral autograft transplantation. Eastern Orthopaedic Association. Victoria, BC, Aug 1-4, 2007. Winner of Founder’s Award. Gulotta LV, Rudzki JR, Kovacevic D, Warren RF, Chen CT, Williams RJ. The role of apoptosis in a rabbit model of osteochondral autograft transplantation. International Cartilage Restoration Society. Warsaw, Poland. Sept 29 – Oct 2, 2007. Gulotta LV, Rudzki JR, Kovacevic D, Warren RF, Chen CT, Williams RJ. The role of apoptosis in a rabbit model of osteochondral autograft transplantation. 75th Annual Meeting of the American Academy of Orthopaedic Surgeons. San Francisco, CA March 5 – 9, 2008. Gulotta LV, Rudzki JR, Kovacevic D, Warren RF, Chen CT, Williams RJ. The role of apoptosis in a rabbit model of osteochondral autograft transplantation. Annual Meeting of the Arthroscopy Association of North America (Poster). Washington, DC April 23 – 27, 2008. Drakos M, Allen A, Potter H, Rudzki J, Altchek D. Effective glenoid version in major league baseball players. 76th Annual Meeting of the American Academy of Orthopaedic Surgeons. Las Vegas, NV, 2009. Instructional Course Lecture 303: AC Joint & Clavicle Fracture Controversies. 2013 AOSSM Annual Meeting. Chicago, IL; July 13th, 2013. Instructional Course Lecture 105: Arthroscopic Fracture Fixation – Fractures about the Shoulder. 35th AANA Annual Meeting. Boston, MA; April 14th, 2016. 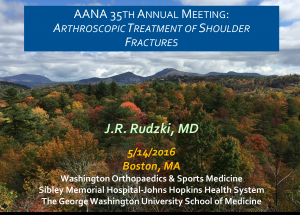 Rudzki JR, McKee MD, Matava MJ, Gamradt S. Instructional Course Lecture: Clavicle Trauma –From Midshaft Fractures in Contact Athletes to Distal Clavicle Fractures and Acromioclavicular Joint Injuries. 84th Annual Meeting of the American Academy of Orthopaedic Surgeons. San Diego, CA; March 14-18, 2017. 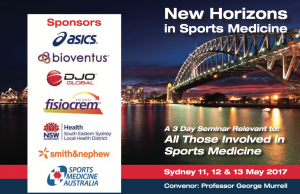 Re-operation Rates & Outcomes after Operative Treatment of Displaced Clavicle Fractures – New Horizons in Sports Medicine Conference.Sydney, Australia; May 11- 13, 2017. 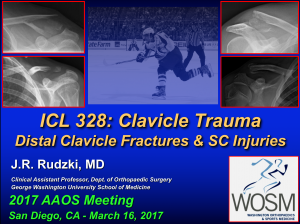 Rudzki JR, McKee MD, Matava MJ, Gamradt S. Instructional Course Lecture: Clavicle Trauma –From Midshaft Fractures in Contact Athletes to Distal Clavicle Fractures and Acromioclavicular Joint Injuries. 85th Annual Meeting of the American Academy of Orthopaedic Surgeons. New Orleans, LA; March 6-10, 2018. Current Concepts in Hemiarthroplasty for Proximal Humerus Fractures. Orthopaedic Trauma: Concepts to Controversies. Snowmass, CO; February 16, 2008. 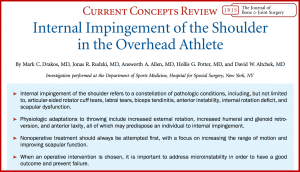 Total Shoulder Arthroplasty & Hemiarthroplasty: Indications, Technique, & Results. 27th Annual Cherry Blossom Festival. Falls Church, VA; April 5, 2008. Current Concepts in Meniscal Transplantation. 27th Annual Cherry Blossom Festival. Falls Church, VA; April 5, 2008. Rotator Cuff Treatment Symposium: The role of vascularity and contrast-enhanced ultrasound in Rotator Cuff Disease. X Congreso Internacional de Artroscopia y Medicina del Deporte – 10th International Congress of the Argentinian Arthroscopy Association. Buenos Aires, Argentina; May 8, 2008. 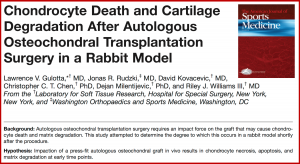 Articular Cartilage Lesion Symposium: Chondrocyte apoptosis and cartilage degeneration after ostochondral allograft transplantation in a rabbit model. X Congreso Internacional de Artroscopia y Medicina del Deporte – 10th International Congress of the Argentinian Arthroscopy Association. Buenos Aires, Argentina; May 9, 2008. Acromio-clavicular Joint & Distal Clavicle Injuries in Hockey: Current Concepts & Future Directions. AOSSM/NHL Meeting – The Puck Stops Here. Chicago, IL; August 22, 2008. Knee Ligament Injuries in Hockey. AOSSM/NHL Meeting – The Puck Stops Here. Chicago, IL; August 23, 2008. Associate Master Instructor. Arthroscopy Association of North America, Orthopaedic Learning Center. Shoulder Arthroscopy Course. Chicago, IL; October 10-12, 2008. Examination of The Thrower’s Elbow. Sports Medicine & Baseball Meeting. Washington, DC; January 10, 2009. Emerging Concepts in Treatment of AC Joint Injury 28th Annual Cherry Blossom Festival. Falls Church, VA; April 5, 2009. Current Concepts in Shoulder Arthroplasty 28th Annual Cherry Blossom Festival. Falls Church, VA; April 5, 2009. The Role of Vascularity in Rotator Cuff Disease & Repair Washington DC Chapter, American Physical Therapy Association. Washington, DC; April 30, 2009. Labral Pathology in Throwing Athletes Arthrex Surgical Skills Training Course: Surgical Management of Upper Extremity Injuries in Pitchers. Scottsdale, AZ; May 15, 2010. Ulnar Neuritis in Throwing Athletes Arthrex Surgical Skills Training Course: Surgical Management of Upper Extremity Injuries in Pitchers. Scottsdale, AZ; May 15, 2010. Treatment of Primary Anterior Shoulder Instability Arthrex Surgical Skills Training Course: Management of Complex Problems in Shoulder Instability. Naples, FL; July 10, 2010. 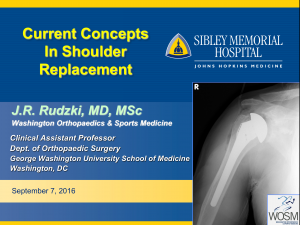 Current Treatment of Rotator Cuff Disease Sibley Memorial Hospital. Washington, DC; October 13, 2010. Old Injury, New Treatment: Arthroscopic Techniques in Treating AC Joint Injury 30th Annual Cherry Blossom Seminar. Rosslyn, VA; April 1, 2011. 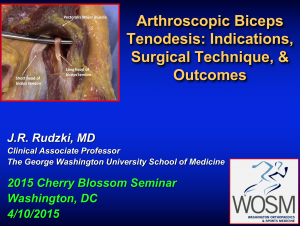 Surgical Approaches to the Articular-Sided Partial-Thickness Rotator Cuff Tear 30th Annual Cherry Blossom Seminar. Rosslyn, VA; April 1, 2011. Management of AC Joint Injury 31st Annual Cherry Blossom Seminar. Rosslyn, VA; April 4, 2012. Arthroscopic Tibial Inlay Posterior Cruciate Ligament Reconstruction – Arthrex Master’s Knee Course. Los Angeles, CA ; May 12, 2012. Unicondylar Knee Arthoplasty Design & Technique – Arthrex Master’s Knee Course. Los Angeles, CA ; May 12, 2012. Injuries about the Clavicle in Ice Hockey Keep Your Edge: Hockey Sports Medicine – AOSSM & NHL TPS. Toronto, CN ; August 24, 2012. Surgical Management of Proximal Humerus Fractures Georgetown University Shoulder Conference. Washington, DC; January 23, 2013. Instructional Course Lecture SK11 – Shoulder Arthroplasty Lab Instructor 80th Annual Meeting of the America Academy of Orthopaedic Surgeons. Chicago, IL ; March 22, 2013. Evolving Treatments of the Unstable AC Joint 32nd Annual Cherry Blossom Seminar. Rosslyn, VA; April 6th, 2013. Evaluation & Current Treatment of Proximal Humerus Fractures 32nd Annual Cherry Blossom Seminar. Rosslyn, VA; April 6, 2013. Visiting Professor Grand Rounds- ACL Reconstruction: Role of the Hamstring Autografts & the Antero-Medial Portal. Galway, Ireland; May 25, 2013. Visiting Professor Grand Rounds- Proximal Humerus Fracture Care & Controversy. Galway University Hospital, Ireland; May 25, 2013. Arthroscopic Tibial Inlay Posterior Cruciate Ligament Reconstruction – Arthrex. Master’s Knee Course. New York, NY; August 17, 2013. Unicondylar Knee Arthoplasty Design & Technique – Arthrex. Master’s Knee Course. New York, NY; August 17, 2013. Meniscal Repair & Meniscal Allograft Transportation – Arthrex. Master’s Knee Course. New York, NY; Oct 19, 2013. Advances in Arthroscopic Posterior Cruciate Ligament Reconstruction & Treatment of Multi-Ligament Injuries about the Knee – Arthrex. Master’s Knee Course. Vail, CO; March 3, 2014. Medial Patellofemoral Ligament Reconstruction – Arthrex. Master’s Knee Course. Vail, CO; March 3, 2014. Shoulder Arthroscopy in Beach Chair vs Lateral Position: Point- Counterpoint. 2nd Annual Walter Reed Military Sports Medicine Symposium/ 33rd Annual Cherry Blossom Seminar. Rosslyn, VA; April 4, 2014. Surgical Treatment of Proximal Humerus Fractures- Open Reduction Internal Fixation. 2nd Annual Walter Reed Military Sports Medicine Symposium/ 33rd Annual Cherry Blossom Seminar. Rosslyn, VA; April 4, 2014. Point-Counterpoint: Management of Unstable AC Joint Injuries 2nd Annual Walter Reed Military Sports Medicine Symposium/ 33rd Annual Cherry Blossom Seminar. Rosslyn, VA; April 4, 2014. Annual Arthrex Sports Medicine Fellows Forum Faculty Instructor. Naples, FL; June 5-6, 2014. 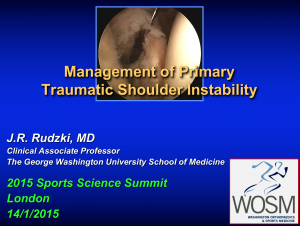 Arthroscopic Treatment of Primary Shoulder Instability 2015 Sports Science Summit. London, England; January 14, 2015. Arthroscopic Biceps Tenodesis: Indications, Surgical Techniques, & Outcomes. 34th Annual Cherry Blossom Seminar. Rosslyn, VA; April 10, 2015. Re-operation Rates & Outcomes after Operative Treatment of Displaced Clavicle Fractures – New Horizons in Sports Medicine Conference. Sydney, Australia; May 11- 13, 2017.